Reset service light indicator Skoda Superb. From year: 2001, 2002, 2003, 2004, 2005, 2006, 2007, 2008, 2009, 2010, 2011, 2012, 2013. How to reset service light indicator Skoda Superb 1. Press and hold right button on the dashboard. Switch the ignition to on, do not start the vehicle. Now turn button located on the left on dash to the right in clockwise direction. The service indicator was reset. Reset service light indicator Skoda Superb 2. From year: 2008, 2009, 2010, 2011, 2012, 2013. 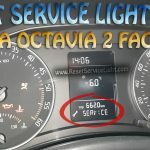 How to reset service light indicator Skoda Superb 2. Before the next service interval, a key symbol and the remaining kilometres are indicated on the display for several seconds after switching on the ignition. At the same time, the remaining days until the next service interval are displayed. Service in … km or … days. The kilometre indicator or the days indicator reduces in steps of 100 km or, where applicable, days until the service due date is reached. As soon as the due date for the service is reached, a flashing key symbol and the text Service appears in the display for several seconds after the ignition has been switched on. Displaying the distance and days until the next service interval. You can use the button 3 to display the remaining distance and days until the next service interval » see above picture. A key symbol and the remaining distance appear for several seconds in the display. At the same time, the remaining days until the next service interval are displayed. On vehicles which are equipped with the information display, you can call up this display in the menu Settings, see the below info. It is only possible to reset the Service Interval Display, if a service message or at least a pre-warning is shown in the instrument cluster display. We recommend that this reset is completed by a SKODA specialist garage. Resets the memory of the display after the appropriate inspection. Adds an entry to the Service Schedule. Affixes the sticker with the entry of the following service interval to the side of the dashboard on the driver’s side. Reset the service interval display by using the reset button 7 from above picture. On vehicles which are equipped with the information display, you can reset the Service Interval Display in the menu Settings see the below info. Operating with the buttons on the windscreen wiper lever. Activate the Main menu by pressing the rocker switch A button from above picture for longer. Individual menu items can be selected by means of the rocker switch A . When the pushbutton B is briefly pressed, the information you have selected is displayed. Operating with the buttons on the multifunction steering wheel. Activate the Main menu by pressing and holding the button C button from above picture for a short while. By briefly pressing the C button you will reach one level higher. The individual menus can be selected by pressing the adjustment wheel D. The selected menu is displayed after briefly pressing the adjustment wheel D .
The menu items Audio and Navigation are only displayed when the factory-fitted radio or navigation system is switched on. The menu item Aux. heating is only displayed if a factory-fitted auxiliary heating is installed. The menu item Assistants is only then displayed if the vehicle is fitted with fatigue detection. Note, if the information display is not activated at that moment, the menu always shifts to one of the higher levels after approx. 10 seconds. You can change certain settings by means of the information display. The current setting is shown on the information display in the respective menu at the top below the line. Select the menu item Back to return to one level higher in the menu. Service, here you can have the remaining kilometres and days until the next service interval displayed, and reset the Service Interval Display. That it is the full procedure how to reset service light indicator Skoda Superb B6 (3T). If you like to reset any maintenance oil light after an oil change. Or reset check engine light, airbag light, inspection key or insp errors when maint reqd, for Skoda cars. Or any warning light for service reminder which appears on the display. Write in the search box the car name for which you want to find information, and find how to reset other service reminders by yourself. Click hear to see full procedure how do you reset the oil light indicator. How to reset the maintenance light and how do you reset service light for all Skoda vehicles.